Mike Mussina was one of the greatest pitchers of all time. He pitched his entire career in the AL East at the height of the steroids era. Despite facing juiced batters in hitter-friendly parks, his numbers compare favorably with Hall of Famers from any point in baseball history. A win would give the Yankees a three-game series sweep at Fenway Park, and a commanding lead over the rival Red Sox in the American League East race. A loss would allow Boston to creep to within seven games, with 25 left to play. The teams entered the ninth inning deadlocked in a scoreless tie, when the Bronx Bombers finally broke through with the sole run of the game. Mike Mussina would return to the mound in the bottom half, looking to finish the complete game shutout, seal the sweep, and something else which he had never done before. Mussina had retired all 24 batters he faced, and was three outs away from throwing a perfect game. “Moose” nailed down the shutout and the sweep. However, a Carl Everett pinch-hit single with two strikes and two outs spoiled Mussina’s bid for perfection. He failed to achieve baseball immortality on that early September day in 2001, but Mussina accomplished it another way. He built an unimpeachable Hall of Fame résumé over a spectacular 18-year major league career. Mussina was a five-time All-Star and won seven Gold Glove Awards. He was a top-six finisher in the Cy Young Award balloting nine times, including a second place finish in 1999. Mussina also received MVP votes three times. His first full year in the majors was the 1992 season, when he paced the league with a .783 winning percentage. He led the league in wins (19) and shutouts (4) in 1995, starts in 1996 (36) and 2008 (34), innings pitched in 2000 (237 1/3), and FIP (2.92) in 2001. With the exception of his rookie campaign, during which he only made 12 starts, Mussina achieved double-digit wins every year throughout his career. He also had a winning record in every season except for his 1991 debut (4–5) and in 2000 (11–15), when he pitched for a woeful Orioles team that finished 14 games under .500. He had the second highest pitching WAR and finished sixth in the Cy Young voting that year. Mussina set an AL record by winning 11 or more games in 17 straight seasons. That record still stands today. He recorded at least 15 wins 11 times. In 2008 at age 39, he became the oldest pitcher to win 20 games in a season for the first time. His 270 career wins places him 33rd on the all-time list. He is ranked 20th on the strikeout list with 2,813. He is also 23rd in WAR (82.7), 33rd in games started (536), and 66th in innings pitched (3,562 1/3). Among pitchers tossing a minimum of 3,000 innings, Mussina is 20th with a 123 ERA+. His .638 winning percentage is sixth among pitchers with a minimum of 400 decisions. Christy Mathewson, Roger Clemens, John Clarkson, Randy Johnson, and Pete Alexander are the only five pitchers in baseball history to have tallied at least 400 career decisions and finish with a higher winning percentage than Mussina. All except Clemens are already enshrined in Cooperstown. Cy Young, Steve Carlton, Bob Gibson, Warren Spahn, Walter Johnson, Tom Seaver, Bob Feller, Carl Hubbell, Jim Palmer, Tom Glavine, and Greg Maddux are among a long list of Hall of Famers with at least 400 decisions and a lower winning percentage than Mussina. Mussina’s 123 ERA+ is a better mark than 36 pitchers already in the Hall of Fame, including Nolan Ryan, Don Drysdale, Eddie Plank, Carlton, Spahn, Feller, and Glavine. Mussina’s 3.57 FIP tops Red Ruffing, Early Wynn, Phil Niekro, Glavine, and many others. Tommy John, Jim Kaat, and Clemens are the only live-ball era pitchers with more wins than Mussina’s 270 who haven’t been honored with a Hall of Fame induction. Pedro Martinez, Catfish Hunter, Juan Marichal, Drysdale, Gibson, and Palmer are among those with fewer win totals who have. Mickey Lolich, Curt Schilling, and Clemens are the only pitchers with more career strikeouts than Mussina who haven’t been inducted. There are over 50 pitchers with fewer K’s already enshrined. Only 27 pitchers in baseball history have finished their careers at least 100 games over .500. Mussina, Clemens, Andy Pettitte (not yet eligible), and nineteenth-century hurler Bob Caruthers are the only ones without a Hall of Fame plaque. Discounting Clemens, every single pitcher in major league history with a higher WAR than Mussina has already been inducted into Cooperstown. Red Ruffing, Ryan, Glavine, Palmer, Marichal, Drysdale, Sutton, and Hubbell are among the 50 Hall of Famers who compiled a lower career WAR. With a 63.8 JAWS score, Mussina tops Don Sutton, Ed Walsh, Wynn, Ryan, Palmer, Glavine, and many others. Every pitcher with a higher score is already enshrined except Clemens, Schilling, and nineteenth-century hurler Jim McCormick. From 1991–2008, only Greg Maddux (295), Tom Glavine (272), and Randy Johnson (271) had more wins than Mussina’s 270. Moose topped Roger Clemens (238), Andy Pettitte (215), Curt Schilling (214), and Pedro Martinez (214). One pitcher whose career closely parallels Mussina’s is Tom Glavine. He made his debut in 1987, and like Mussina, retired following the 2008 season. Over his career, Mussina had more strikeouts per nine (7.1 to 5.3), fewer walks per nine (2.0 to 3.1), and a higher strikeout to walk ratio (3.58 to 1.74). 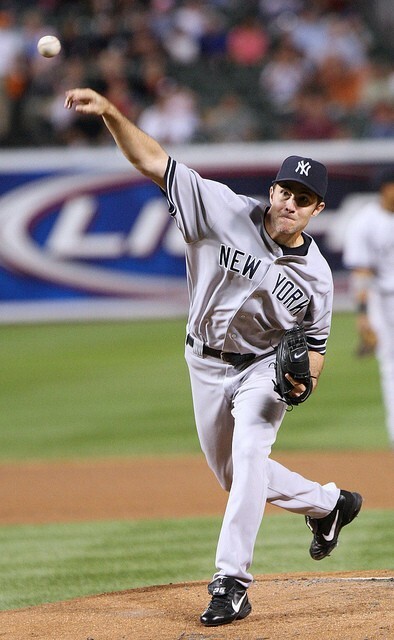 Mussina had a better WHIP (1.19 vs. 1.31), FIP (3.57 vs. 3.95), and ERA+ (123 vs. 118). Despite throwing over 800 fewer innings (3,562 2/3 vs. 4,413 1/3), Mussina tallied more strikeouts (2,813 vs. 2,607). Glavine won 35 more games, but needed 146 more starts to do it. Mussina’s .638 career winning percentage tops Glavine’s .600, as does his WAR (82.7 vs. 74.0). Tom Glavine was named on 91.9% of the ballots and elected to the Hall of Fame in his first year of eligibility. He absolutely deserved it. But Mussina clearly had better career numbers, so why is he still waiting? This will be Mike Mussina’s fifth time on the ballot. He received only 51.8% of the vote last year, despite possessing impeccable credentials. I have heard a number of excuses as to why Mussina has been kept out of Cooperstown. One is that he failed to reach the elusive 300-win threshold. Strange that the same voters who rail against “compilers” would hold it against someone who chooses to go out on top, rather than hang around to accumulate 30 more wins. Only 24 pitchers in baseball history have won 300 or more games. Every one except Rogers Clemens has been elected to the Hall of Fame. That means 51 pitchers currently enshrined in Cooperstown failed to hit that mark. By the way, the average win total for the 74 Hall of Fame pitchers is 253. Mussina beats that number by 17. Another argument we hear is that Mussina’s 3.68 ERA was “high” compared to those already in the Hall of Fame. But ERA+ has been established as the more accurate measure of a pitcher’s performance after considering ballpark factors. Mussina’s 123 ERA+ is better than half of the pitchers already enshrined in Cooperstown. Still another gripe people have is that Mussina never won a Cy Young Award. But in 2001 he had a lower ERA (3.15 to 3.51), better ERA+ (143 to 128), and better WHIP (1.01 to 1.26) than Roger Clemens, the winner of the award. Mussina had more strikeouts per nine, fewer walks per nine, and a higher strikeout to walk ratio. Moose also spun four complete games (three were shutouts), versus zero for the Rocket. Forget for a moment that Mussina was clearly robbed of a Cy Young Award in 2001. Doesn’t the fact that he finished in the top six in nine of his 18 seasons prove that he was regarded as one of the game’s elite arms? Falling short of a win is irrelevant, and a silly reason to keep one of the best pitchers of all time out of Cooperstown. Another equally baffling argument is that Mussina wasn’t the best pitcher on the team while he was with the Yankees. Really? It’s strange that the same excuse wasn’t used to keep Smoltz, Maddux, or Glavine out of the Hall. Nevertheless, let’s examine the assertion. We already established that Mussina deserved to win the Cy Young in 2001. He also led the Yankees in ERA, ERA+, WHIP, and FIP in 2003, 2006, and 2008. So he was the top-performing pitcher on the Yankees in four of his eight seasons in New York. This despite pitching alongside Roger Clemens, Andy Pettitte, Randy Johnson, and others who had some superb years. Mike Mussina pitched his entire career in the AL East at the height of the steroids era. Despite facing juiced batters in hitter-friendly parks, his numbers compare favorably with Hall of Famers from any point in baseball history. That Mussina only appeared on 20.3% of the ballots in his first year of eligibility is an unconscionable crime. He should have been inducted in the same class as his contemporaries, Greg Maddux and Tom Glavine. It’s time for Hall of Fame voters to step up and give Mike Mussina the credit he so richly deserves. A good hard look at the game we know and love. Featuring analysis, wise cracks, previews and picks, the Payoff Pitch Podcast, and more.